One of my children has entered the world of leveled readers. We homeschool, and to keep up the practice of reading out loud every day and using that newly acquired muscle, I try to get four to five of My First, or Level 1 books for him to read during school hours every week. I found this book at the library and decided to check it out. Written by Marion Dane Baeur, these books are cross-subject educational: reading practice and geography. 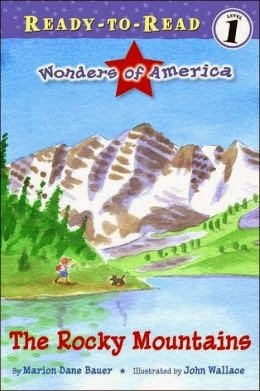 The Wonders of America series have about 10 books or so all together. Included in these are titles about Yellowstone, the Grand Canyon, Niagra Falls, and more. Sometimes leveled readers are hard to sit through. Listening while a child is in the early stages of reading can be a test in patience, but sometimes the books even more so! I like having a book that is an early leveled reader that is also non-fiction, and is relatable to the child more than an action figure on TV or the puppy whose storyline more fits 3 year olds than the 5 and 6 year olds who are reading it. These simple and short stories even have a historical lesson tucked inside the meager 30 pages, and each are under three sentences a page, helping my early reader not get too tired and exasperated from the effort. Although the illustrations aren't my favorite, I'm going to be checking out the entire series from the library, and telling my kids which places I've visited, while helping that young reader sound out words and string together sentences.